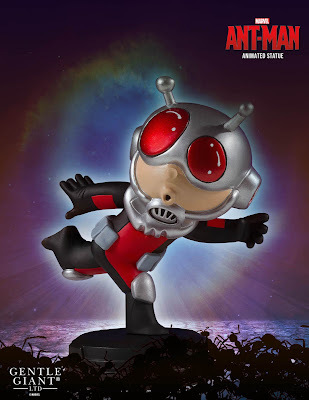 Gentle Giant’s adorable line of Marvel Animated Mini Statues based on the artwork of Skottie Young and his popular Baby Marvel variant comic book covers expands once again with the addition of The Avengers smallest member, Ant-Man! Scott Lang in is a panic and is running for his life in this charming new statue that is based on Skottie’s variant cover for The Astonishing Ant-Man #1. What’s cool about this release is that it’s up to you if you want to consider him in scale with the rest of the line or if he is “actual size”! The Ant-Man Animated Marvel Mini Statue by Skottie Young is Gentle Giant’s 16th release in this fantastic, ongoing series. Each piece is hand-cast, hand-painted and hand-numbered with a limited edition certificate of authenticity. This Animated Ant-Man statue can be pre-ordered now at Entertainment Earth for $64.99 here.